Waking up in Donostia is already wonderful. Your day can continue even better if you full your stomach with an exquisite breakfast in a charming bar… Here our small selection of Bars for a breakfast or mid-morning snack. Enjoying some fantastic gastronomic experience during your stay at our hotel in San Sebastian. Possibly you woke up this morning, enjoyed a wonderful buffet breakfast at our hotel and had a walk in San Sebastian. It is already 12 o clock and after a morning of sightseeing you feel like having a snack. Here is our list of places where you can enjoy breakfast or a fast snack. If you fancy a sandwich, the “sandwich of the day” is always a great choice, good and cheap. Each place is unique. Open to new experiences and tastes. Choose from the varied dishes Donostia offers you out of the routine. 1) Pastelería Oiartzun - www.pasteleriaoiartzun.com for classic , featuring recommend this bakery for breakfast, “horchata” (traditional beverage made of ground almonds, sesame seeds, rice, barley, or tigernuts) , croissants , truffles , pastries, a variety of coffees , pastries, cakes , tasting his own traditional house. You can enjoy this either inside or outside in the terrace. 2) Restaurant Europa - restauranteeuropadonosti.com offers a creative cuisine with roots in traditional Basque cuisine, always fresh market products . The café, for the most traditional and delicious kebabs for those who want a typical breakfast Donostia . Some of their specialties is rice, the neck with fried , hake with crab , steak tacos with blue cheese , French toast and apple crumble. 3) Txondorra - Enjoy the specialty of their pintxos . From foie risotto with mushrooms and parmesan , the kangaroo taco with two sauces. It offers an excellent menu of hot skewers doing at the time . The restaurant has a couple of dining rooms where to do tasting at the very convenient price of 15 € and 17.50 € weekdays weekends. Quality, innovation, professionalism and friendliness of the innkeepers. 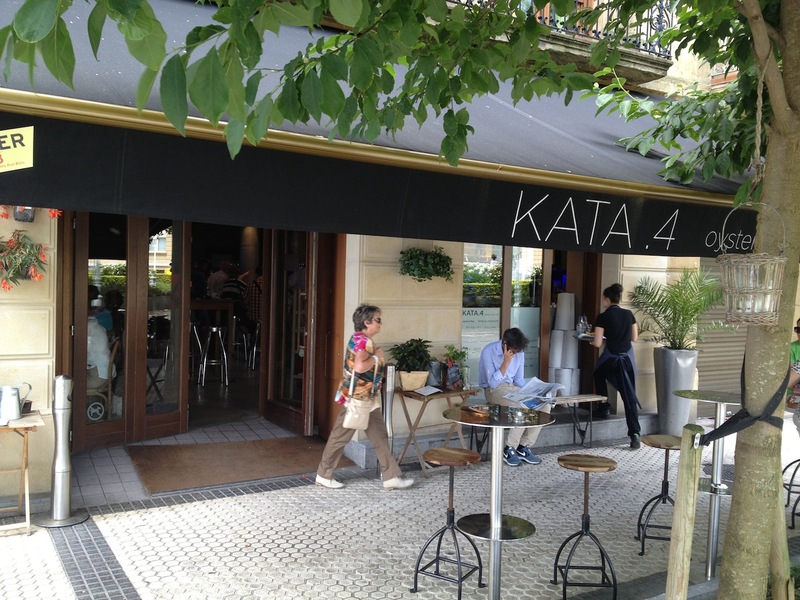 Your time is continued for 10-24 h.
4) Kata.4 Oyster Bar - www.kata4.com innovative concept in San Sebastian city center, where you can have breakfast without rush. This stylish design bar offers dishes of culture and culinary traditions of the Basque Country. Small tastings, the original pintxos (spikes) with peppers , sirloin , exquisite mussels, rice with clams, cover egg bathed in sauce with ham and other delicacies puree more. 5) Bi Dakara Tavern – Food for foodies: foie, skewers, or cuttlefish, an incredible sandwich called "Dakara" or skewer steak with foie, as well as the tail of the devil ( shrimp ) and croquette fungi . 7 skewers and 1 Beer worth about € 14.5. 6) Sport Bar - 943 42 68 88 The crepes with crab , foie skewer and spectacular sandwiches are most demanded in this bar in Donostia. With the Certificate of Excellence 2013 TripAdvisor has earned the people is one of the places you cannot miss in the list. 7) Bar Swing - www.hlondres.com/es/swing bar The bar of our hotel is ideal for a tea or a coffee overlooking the sea. In the summer you can enjoy the wonderful terrace right in front of La Concha in San Sebastián . This English style bar has been recently renovated. Now it is up to you. Have a look at this nice bars and make your decision. Enjoy your stay in San Sebastian with the 5 senses. Bon appetit !